I kind of felt like the announcer from a popular TV game show when I was writing up this post. “The next prize up for grabs is this spacious and energy efficient Kenmore Elite Refrigerator! It features 28 feet of cubic space with it’s convenient SlideAway shelves and it can be your’s…. if the price is right!” Really though this is a great prize that I am sure one of you would be thrilled to win. Granny does need a new refrigerator but does not have the space for it. As I’ve mentioned before I live in a pretty small house and the way the kitchen cabinetry was built it limits you to a certain size of fridge, specifically the sizes that were common in the late 70’s. Unfortunately for me, but perhaps fortunately for most, refrigerators have only gotten bigger as the years have passed and now most modern sized fridges don’t fit the space. There’s always the option of ripping out one of the cabinets, or all of them for that matter, but like usual that’s just another project, for another time, with another budget. 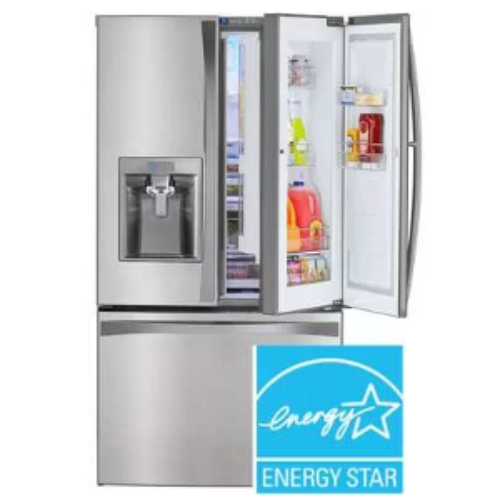 Unfortunately for me, I’m stuck running a smaller, older, less energy efficient fridge which really is a shame because the new Energy Star certified models like this one consume around nine percent less energy than the federal standard, to save you as much as $300 over 5 years. Every little bit of savings helps! Plus it’s more environmentally friendly as it prevents more than 1,000 pounds of carbon pollution versus it’s previous equivalent. That’s what I call a win-win. And that’s not to mention the convenience. These modern fridges really are amazing with all their space-saving features. This Kenmore Elite includes SlideAway shelves and a Tilt-N-Take freezer door, both designed to maximize the usable space inside. The freezer door part is really neat, how the door tilts out and forward to expose 3 separate compartments of varying sizes that are perfect for organizing and storing frozen goods. And that also leaves the entire french-door style top for your refrigerated items, and includes a Grab-N-Go door so you can store and access smaller items like sodas, dressings, condiments and butter without having to open the entire fridge and let out all that energy. I want to wish my subscribers and fans the best of luck to win this contest. I know one of you has the perfect spot in your kitchen awaiting this gorgeous new fridge. I really need a new refrigerator. I want to Win a new Kenmore Elite Refrigerator.